Mail4Rosey: Kinivo for Dads or Grads! Disclosure: I received a sample product in exchange for the post. All opinions stated are genuine and my own. Some gifts are universally loved, regardless of age. Kinivo has a site like that...where you can find gifts for dads or grads that would be appreciated by both...and the items are priced right too. I found two that I really like, that could be used as a great gift idea for dad or grad. rechargeable battery & enhanced bass resonator. I like that you can just plug your device right into the mini speaker. 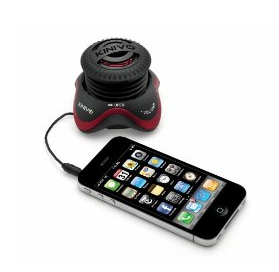 With the Kinivo, you can just plug your iPod into it and put in on the table next to you. I know my husband would like this for Father's Day because he's always got his iPod in his hand. This would be an easy way to hear his music without having to have the laptop close by. Graduates would love it too because it's fun, it's handy, and what young woman/man doesn't love listening to tunes...often? :) The sound is crystal clear, which is definitely one of the most important things to know. Full-bodied, 360-degree sound with modular design. Connect Multiple Speakers for Maximum Sound. You can hook up multiple speakers if you like it loud! And it comes with a handy carrying case. 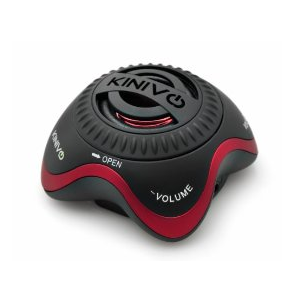 You can get the Kinivo mini-speaker in a variety of colors, and it comes in a handy carrying case too. 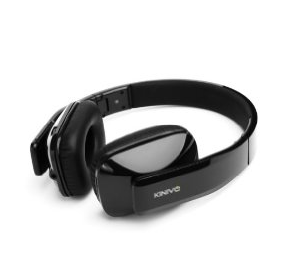 The second Kinivo item I really like for dads or grads is the Kinivo BTH410 Hi-Fi Bluetooth Stereo Headphones. These are nice and padded on the ears (hubby doesn't like the ones that are not). They also allow you to switch tracks and/or adjust the volume right from the headphones. With a battery time that boasts 8 hours of continuous talk or playback (200 hours in standby mode), these are nice! Nothing's worse than running around with your cordless headphones and having the battery die (I've had that happen on the riding mower, big bummer too!). If you use them to answer a call, it switches from music to phone (and back) without missing a beat. The buttons for that are located right on the sidebar of the headphones, so once you get used to them, you'll be able to do it without even looking. Compatible with Bluetooth enabled music players & A2DP enabled devices such as iPad, iPhone, iPod touch,Android Smart Phones, tablets, etc. 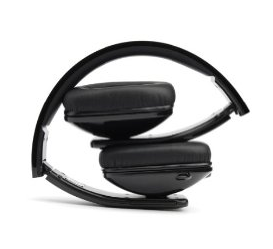 Compact and comfortable design with up to 8 hours of music and talk time. You can learn more about these two items, and many other gift options for the dads/grads in your life too, by visiting the Kinivo website. You can also follow them on Facebook and/or Twitter. Would you get either of these for the dad or grad in your life? Way cool, but hubby wouldn't have a use for this. We have one flip cell phone. Hubby had the text option turned off. That's how antiquated we are. This looks cool! I've never heard of it. These portable speakers are great. (Sorry to hear about your treadmill mishap!) We are all using headphones in this house, and any one of us would love these from Kinivo. Oh yes, this is totally something my husband would love. I think being able to daisy chain the speakers together is really cool. Thanks so much for sharing this speaker! Dads can be SO hard to shop for. I have my husband covered, but my in law already has everything and instead of having more hobbies, has to watch my niece and nephew most of the time. If I remember correctly, it was always a problem to know what to buy my father but these are definitely two great ideas. My husband would love this! He loves to listen to his music, but he's always complaining about the sound on his phone. These look great. The speaker would be great for my son for graduation. I agree - my grandson would love the speaker for his 8th grade graduation. My husband is a huge music lover. He would be happy to get the portable speaker for Father's Day. I never heard of this before and I am interested in it for the deck. That portable speaker would be perfect for my husband when he's outside weeding or something. He would love it. I like how small this speaker is. It looks good for travelling. This would be very handy to have in Jason's garage. He is always stealing my wireless speaker, so I need to think about getting him his own! Those are really nice looking and the speaker is perfectly pocket-sized. What a great line! My husband would love this so much! What a great Father's Day gift idea. That speaker is a fantastic idea. I may have to check it out for my son! This is a fantastic gift idea. We're always listening to music, ebooks and podcasts. Portable speakers are so great to have. My hubs and I didn't even realize we needed them until we got one and WOW, the sound is incredible. My husband would like the top one. Right now he sticks his cell phone in a cut to get the noise to echo. What a goof! I have a few Kinivo products that we got last year I think and they're amazing. For being so reasonably priced I thought they wouldn't have been as good but they are. The hubs and my eldest son would love this! That portable speaker looks awesome. I can see my hubby using that while grilling outside or working on his car. Great gift ideas. Nice items - not sure what I am getting hubby for Father's Day - the speaker I know he would really like. awesome... oh and I love you can add more speakers if you want it even louder! These sound like wonderful gifts! My husband was asking for headphones like this because father's day AND his birthday are coming up. I appreciate your recommendation and will go look into these. My husband would love this! He always complains about phone volume. This is an excellent gift idea. I know my husband would love this, and so would I. It's also a great gift idea for Grad's too!! Wow, what a great gift for Father's Day! I learned so much! Terrific job! Very cool! My husband wants some new electronics for Father's Day! I bet he would like that speaker! Thanks for the funny visual of you on the treadmill. Too funny!! These would be great for traveling! I need a good set of headphones, too! Portable speakers are great gifts for anyone definitely! I can think of a few people who would LOVE this! These are all products that my husband woudl love! Thanks for the ideas! Forget dads and grads, I want this! I've been looking for a good portable speaker and this looks like it can do the trick! I've been looking for a reason to replace my old Bluetooth speaker. I think you may have given me the perfect excuse with this post. I love this speaker! That would be a great gift for my husband. He mans the grill during family BBQ's and this would be so great for him while he's flipping burgers. Wow, that would make a great gift. I know my niece graduating would love these speakers. Those portable speakers would make a great gift for my husband. We could take them this summer to our rental house. I know several people who would love this. Perfect gift idea. This portable speaker looks really neat! I love that it comes with a nice carrying case. Kinivo has some pretty neat stuff. I really like the portable mini speaker. This does look like a great site for techy dads! My hubby would love the headphones. That speaker is so cute! I'm gathering a collection of bluetooth speakers lately but I love them. I love the portable speakers! I need that from time to time for when I need music on the go! This is a pretty cool portable speaker. I just bought hubs one for Valentines Day but I am going to tell him I want one like this for my birthday. What a cool little speaker! I love that it's portable and it still looks so stylish.